Do you know what happened in your family seven generations ago? 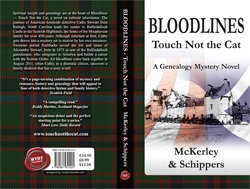 Spanning seven generations and the Atlantic Ocean, Bloodlines – Touch Not the Cat switches back and forth between Victorian Times and three days in 2011, leading the reader to the Scottish Highlands and Boston, USA, combining fact with fiction, within the mysterious journey. In the month of November 1895, the Laird of Ballindalloch, Gordon Macpherson, mysteriously disappears from his Highland Estate. In August 2011, American Homicide Detective Cathy Stewart from Raleigh, North Carolina, reluctantly agrees to join her husband on a trip to Scotland where her detective instincts and Celtic heritage are ignited by a long kept family secret. Seen through the eyes of Alexander Stewart, Bloodlines -Traces, tells the story of WWI British officers, who hide from the public eye , the true casualties of a young Churchill’s miscalculations on Gallipoli. War Correspondents Ashmead Bartlett and Keith Murdoch, manage to smuggle a letter bound for prime minister Asquith and change the face of the war. As one of the first women in the history of the University of Edinburgh, Katherine Macpherson fights her way through pride and prejudice, follows her heart and initiates medical help for the working classes in Leith. Privately owned distillery GlenFroach, has been in the family for generations. With the Scottish whisky industry besieged by foreign investors, present day owner Doug Stein finds himself entangled in a web of espionage. 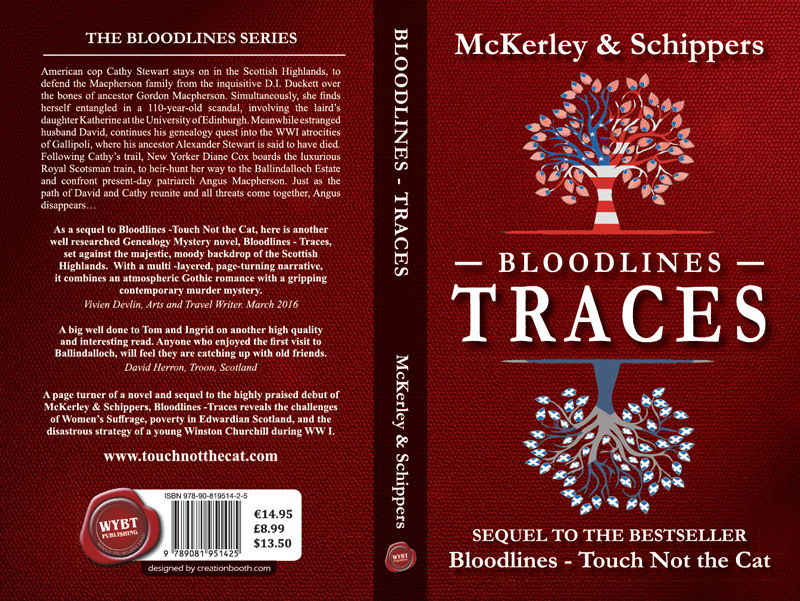 Spiritual insight and genealogy research are the heart of Bloodlines – Touch Not the Cat and its sequel Bloodlines – Traces, the mystery series on cultural inheritance by Thomas McKerley and Ingrid Schippers. The story of American homicide detective Cathy Stewart from Raleigh, North Carolina leads the reader to Ballindaloch Castle in the Highlands, the home of the Macpherson family for over 450 years. Although reluctant at first, Cathy gets drawn into a mystery set in motion by her own ancestors. Victorian period flashbacks reveal the life and times of Alexander Stewart, born in 1875 as son of the Ballindalloch gamekeeper, who emigrates to America, where a dream comes true. Download a pdf with the first four chapters of Bloodlines – Touch Not The Cat. After doing the unthinkable and despite the inquisitive DI Duckett, homicide detective Cathy Stewart stays on in the Highlands, to research the clues she has uncovered, leading to the history of her American family. Intrigued by the Victorian/Edwardian stories of her husband’s Scottish ancestor Alexander Stewart and the laird’s daughter Katherine Macpherson, Cathy sparks a sequence of discoveries guiding her to an astonishing outcome. 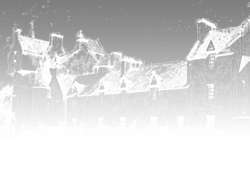 Download a pdf with the first four chapters of Bloodlines – Traces. As a double act Thomas McKerley and Ingrid Schippers have an assured, unique literary talent. The Daily Record, The Daily Record book review by Shari Low, Saturday 16th June 2012. The Scotland Magazine, May/June 2012 edition. “Cover to Cover” review of Bloodlines – Touch Not the Cat: 4 out of 5 stars. 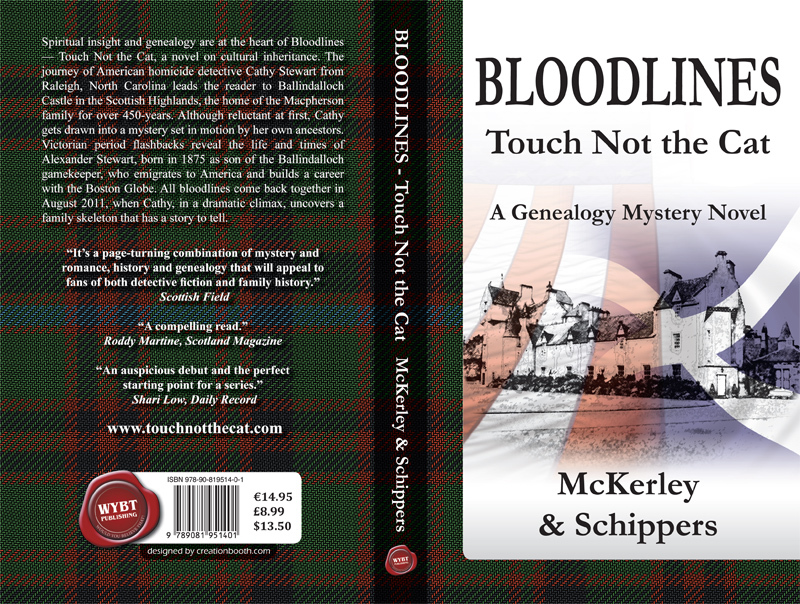 Bloodlines – Touch Not the Cat: The disappearance of Ballindalloch laird Gordon Macpherson in 1895, sets in motion a chain of events, affecting the lives of 7 generations on both sides of the Atlantic. Bloodlines – Traces: Following the trail through time to Edinburgh University in 1896, and the WWI battlefields of Gallipoli in 1915, Cathy Stewart finds some curious twists and turns in the family tree. 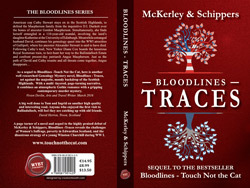 ‘Bloodlines – Touch Not the Cat‘ and ‘Bloodlines-Traces’ were written by author duo Tom McKerley and Ingrid Schippers. Tom and Ingrid are both first-time mystery novel writers. By combining their fortes of down-to-earth structure and spiritual insight, they make a remarkably compatible writers team. Inspired and curious I did some research on Thomas Hardy and found he was very much a defender of the country life-style and even feared for what he called ‘the decline of the rural class’ within the rapid developments of the Victorian Age and its industrial revolutions. As my mother’s school friend pointed out to me, my mother and she shared all big events of a life time. Not only did they sit next to each other at school; they also attended their weddings; witnessed the birth of their children and supported each other after the death of their husbands.